We do a lot of Italian cooking in our house. Sometimes I do more complex things like pizza, meatballs or chicken cacciatore, and sometimes I just want a nice simple bowl of spaghetti and meat sauce. 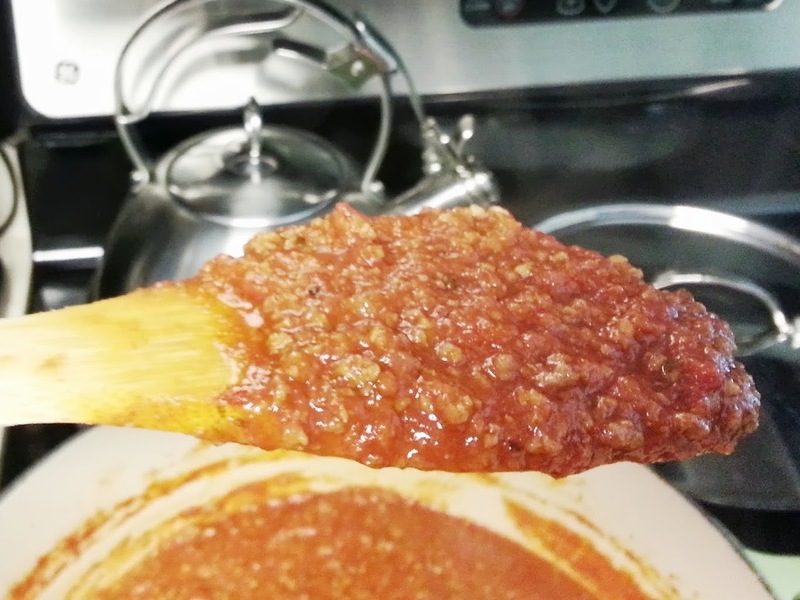 While most bolognese sauces take hours to prepare, you can make this start to finish in about an hour, most of which is just simmering so it’s not hands on time. This recipe uses simple ingredients to bring in huge flavor and create a tender meat sauce. Please be advised: this recipe will cause cranky family members as the aroma floats through the house. There was much whining in my house when I made it. If you want to mix things up a bit, use 1lb of meatloaf mix (beef, pork, veal) in place of the ground beef. Heat a large dutch oven over medium heat. Add carrot, celery, onion and garlic to a food processor or food chopper and process until finely chopped. After dutch oven has been heating for 5 minutes, add 1 to 2 tablespoons of olive oil to the pot along with vegetable mixture. Cook for 2 to 3 minutes until it all starts to smell amazing. Add meat to the pot, using a wooden spoon to break up the meat into pieces. Cook for one minute, stirring the meat continuously. You don’t want big pieces of meat here. We are going for very fine pieces. After one minute, add the milk. The meat will still be pink. The milk will help tenderize the meat and add good flavor. Let the mixture simmer on medium-medium-low (I use a 4 on my gas stove) for 10-15 minutes or until most of the liquid is evaporated. Now add the wine and repeat the process, simmering until most of the liquid is evaporated. You’ll want to make sure you really have very little liquid left so your sauce isn’t watery. It’s much easier to do this when there is little in the pot. Once the liquid has evaporated again, add the tomato paste and combine with the meat mixture. Make sure to mix it in well, then add the crushed tomatoes. Let everything simmer at least 20 minutes to let the sauce thicken. You can simmer it longer if you wish but I’ve found the sauce is very good after 20 minutes. Taste your sauce and add salt and pepper as needed. This sauce freezes very well and makes a large batch which should be enough for two meals, unless you are making lasagna. Serve over spaghetti for a very simple dinner. Combine half the sauce with 1 lb of penne pasta. Pour into a greased casserole dish, top with mozzarella and bake at 350 for 30 minutes or until the cheese is melted and bubbly. Use the entire batch to make classic meat lasagna.